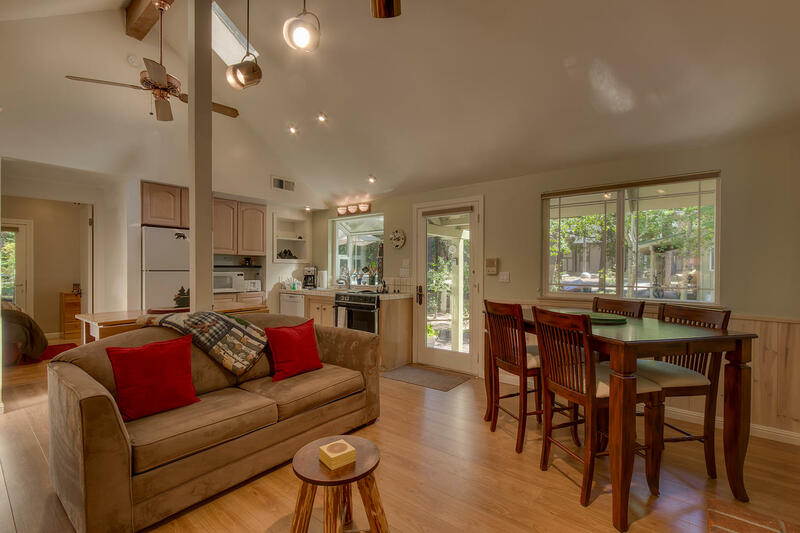 Situated in a quiet West Shore neighborhood, this quaint, cozy cabin is just the right size for a small family or couple's romantic getaway. The living room features vaulted ceilings, a gas fireplace, large flat panel TV, comfortable leather chairs, and a full-sized sofa sleeper. The well-equipped kitchen and adjacent dining area make this a great spot to “dine in”. Weather permitting, you can also barbeque on the gas grill and enjoy eating outdoors while relaxing on the large sun-dappled deck—with two tables and plenty of chairs for seating and sunbathing. Enjoy a long overdue conversation, then take selfies and share, updating your social media status on the Wi-Fi. 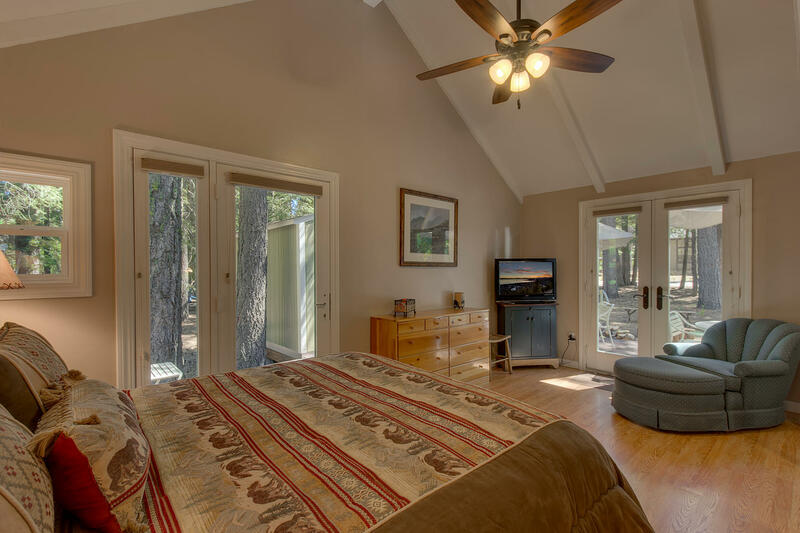 With deck access through two sets of glass doors, the bright and airy bedroom’s queen-sized bed is perfect for lounging, enjoying a novel, or a movie on the TV. 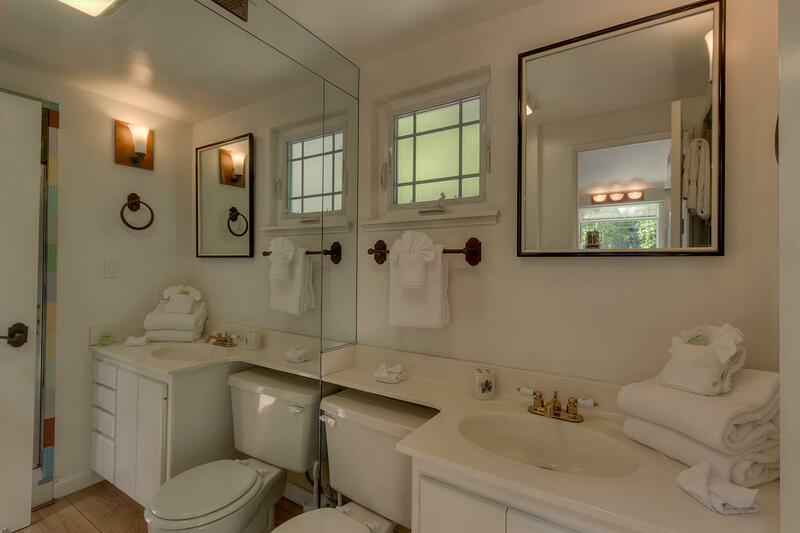 The adjacent bathroom has a shower and bath linens are provided. Venturing out? Many Lake Tahoe activities and sights are right at your doorstep! Sunnywood is close to Meeks Bay, which has a terrific sandy beach, and Chambers Landing, which also has a nice beach. Sugar Pine Point State Park is close enough to reach via a nice walk or bike ride. You won’t want to miss the icon of Lake Tahoe, Emerald Bay, a short drive away. Emerald Bay State Park boasts 360-degree picturesque views that encompass Emerald Bay, Fannette Island, Eagle Falls, and Vikingsholm Castle. To experience all the gambling and nightlife that the Lake Tahoe area offers, South Lake Tahoe and the Nevada state line are about a 30-minute drive. This cute clean convenient cabin was perfect for my husband, me and our dog:) close to Homewood, has everything you might need. Thank you! Very attractive 1-bedroom cottage with sofa sleeper in living room. The bedroom is spacious and has 2 exits. The kitchen is well stocked with cookware and spices. The bathroom was a bit small but overall, I really liked this cottage and would definitely stay again!! Everything we expect for the my first booking via email, check in, staying in 2 nights, to finding out the deco, kitchen cabinet were packed with condiments, spices, olive oils were very impressive to checking out experience was very home warming to us and definitely looking forward to coming back again. The only negative part is it a long way out from the South side city center. Second time we stayed here had a great time! This was our second stay in this cute little cabin. We were busy with our daughter's wedding but it was a comfy, quiet place that is perfect for a couple. We love to cook in when we travel and even though the kitchen is small it is well equipped. First, I'd like to mention the property manager/owner for being very attentive, available, and helpful. The home is in a quiet part of town in between Tahoe City and Camp Richardson. We enjoyed the location. Quiet and peaceful. Read the instructions carefully how to open/lock the doors! It’s not hard after you figure it out, but definitely something new to us. BBQ grill is nice and clean and the wraparound deck in the filtered light is really nice. Great price. This cabin worked just great for my wife and I. We enjoyed walking to the state park. There was everything we need within a short drive. This is my first trip to Tahoe. WE had two big dogs so we wanted to be in the neighboorhood that is dog-friendly, relatively quiet at night and close to beach. It's such a beautiful place and perfect for 2 people and 2 big dogs. My dogs enjoyed neighboorhood walk early morning and evening, I can walk around for hours just looking at houses and my dogs playing with sticks pinecones, meeting other friendly doggies. The house was clean and quiet and had everything we needed for a few days of stay, instruction was very clear. If I had to mention one issue, the french door in bedroom, even though you lock it as it is instructed, if I push the door from outside, it opens very easily, we were surprised and felt a little uneasy when wind pushed the door open when it was locked. I guess it is safe neighboorhood but after we saw that happened, we decided to take our valuables (computers, jeweries with us every single time we left the house even for a quick dog walk. Everything was great, with the exception that the lighting inside was not very good, and the fan in the bedroom did not work. Perfect size for 2 adults and a dog, comfy, cozy, and a full size refrigerator! The neighborhood was quiet, wooded... a perf ct place to walk our dog and enjoy nature. It was clean and efficient. The rental property located in a quite neighborhood, lots of trees, very relax. We enjoyed our stay in the rental. We love this dear place - it is just perfect for us with its privacy and minimum stairs. . The neighborhood is so quiet - a perfect place for an early walk. It is close to everything we need and so well-maintained. This year there was a great improvement added - a nice paved driveway! We couldn't be happier here and consider this our summer get-away. This was a lovely quiet place to stay. However, fortunately we were only staying 4 days as there was no washer and dryer. To be fair this was stated in the description (we missed it) but it is the first VRBO place we have stayed without such facilities. Also it looks like the garage has been sold off, so the picture presented and the description are misleading. Trent was great at communicating. Easy to get in and out! Loved the loacation, very quite and private and between Tahoe City and Sounth Lake Tahoe! This is a great little jewel in a quiet location & perfect for the two of us. It was clean and comfortable and we had everything we needed for a 5 day stay. We had a few very small issues when we first arrived which the owner resolved immediately (he is quick to respond). We loved this little place and would definitely stay again!! It was just what we were looking for near Lake Tahoe. Clean, comfortable, and Cozy. Our booking was very easy and the house was beautiful! perfect for my husband and I! Cozy home in the west shore of Lake Tahoe. This is our third time staying here and we love coming up here. Very quiet, clean and peaceful. The cabin is quite small, perfect for 2. I've stayed 3 times now and will continue come back. Clean, great service, awesome cabin! Point, a box of Kleenex and kitchen towel would have been nice but there were plenty of bath and paper towels. Would use again. Husband and I wanted a little snow-y getaway with our dogs for Spring Break. This cabin was perfectly appointed. It's smaller than it looks from the pictures, probably ~900 sq ft?, but didn't affect our stay at all. It was very clean and though it allows dogs, our dogs weren't interested in any "smells". The wifi was fast, the trash-bear-lock up situation was easy to figure out and it was very convenient not to have to go to a rental office. I was worried that with all the snow it might be hard to find the driveway but it was also well shoveled. The house was VERY well insulated and the fireplace did an amazing job of warming up the place. I was also impressed with how cute and quiet the neighborhood was. We would definitely stay here again. This house is so cozy and well equipped for our purposes that we would gladly go back and rent it again. It has the perfect size for a couple or a small family of 4, amenities to keep you entertained and a gorgeous setting amid fantastic trees. Everything in the house worked perfectly so we would not doubt recommending it to our friends! Great little place for the four of us. It was spotless and exactly what we needed for the couple of days we were there. It was well equipped to cook, watch movies in the evenings and play in the snow during the day. The kids made snowmen in the yard and the setting was beautiful for lengthy walks with the dog. 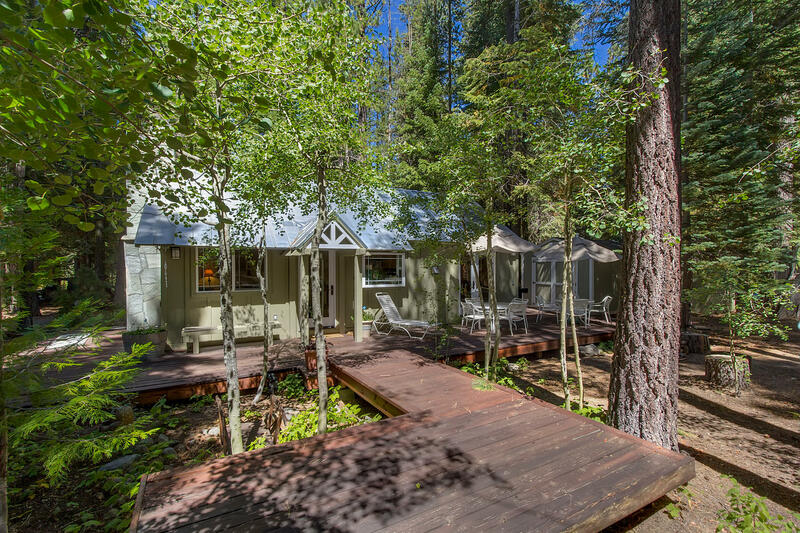 This 1 bedroom cabin had everything we needed for a Tahoe home away from home. Quiet and cozy with an electric fireplace that had adjustable flames made the cold snowy weather outside seem like a Christmas card cover. Would love to take our two maltese dogs and return in the summer. 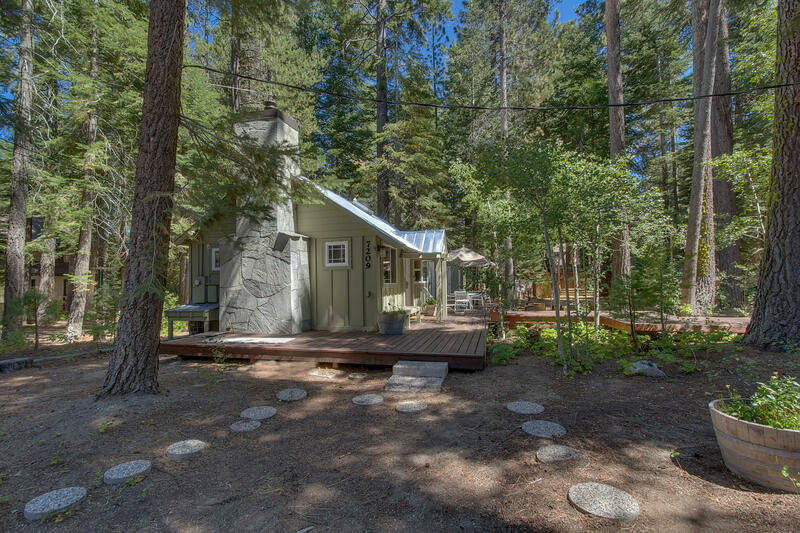 The cabin in Tahoma is located perfectly between North and South Tahoe. It's a quick drive up to Tahoe City which has excellent restaurants and cute shops. A little bit south you have Emerald Bay, excellent hiking and South Tahoe, which is full of restaurants, shopping etc. The cabin itself boasts a cozy atmosphere complete with fire and comfy blankets. We enjoyed our stay and can't wait to come back to the area! Great cabin! We had a very good stay. The accommodations were adequate and clean. The location was good for our needs. Once we booked it online we were never in contact with the property mgr. Again and did not need to be. Deposit was refunded promptly. Cute house. Very clean. Nice deck with table and chairs perfect for enjoying meals outside or coffee in the morning. Surrounded by beautiful pine trees so feels like you're in the woods, even though it's right in town. Easy walk to Sugar Pine State Park and Beach. Although I got our arrival date mixed up, the time we stayed was enjoyable. Having had our own vacation rental in the past we recognized a well appointed cabin. A couple of suggestions- the bathroom door needs to be planed underneath as it sticks on the floor. Also, couldn't figure out how to use gas fireplace. Other wise a very nice place to stay. I would have been happy to vacuum but sorry no vacuum sweeper. Loved the patio area. This is a really nice house, in a quiet, very wooded neighborhood. Being there during the week in September, I'm sure it was more quiet than normal. If you are looking for a great home base in the Tahoe area, this place is excellent. Close enough to the north shore for groceries, shopping and restaurants, but well placed for a variety of hiking trails. The cabin was in a beautiful location in peaceful woodland. It was clean, comfortable and well equipped - plenty of outdoor space and a great BBQ. A short distance to the Lake. Thoroughly recommended. My husband and I enjoyed this quiet retreat that provided great natural beauty all around us. Lake Tahoe was breathtakingly blue. Our little cottage was cozy and cute and the neighborhood was really quiet at this time of year. We mostly heard the wind in the pine trees, birds singing and an occasional dog giving a bark or two. It is an easy walk to the lake and an easy drive to Sugar Pine State Park where there are amazing trails to walk. The kitchen is tiny and since we ate in, it took some skill to maneuver the space. One dish towel was provided and no pot holders were found. We got along with what was there and really loved this place and plan to return to it next fall. 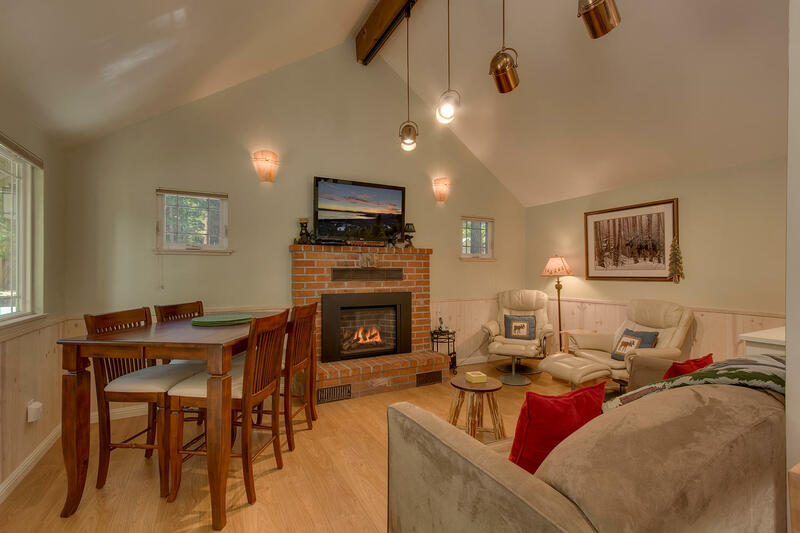 Great little dog friendly cottage in wonderful area of Tahoe. Easy to find, easy to get in, it was clean, it was warm, it was gorgeous, everything worked, plenty of kitchenware for cooking and entertaining, and a great bed. We stayed for a very snowy five days in this cabin. Appreciated being able to extend a day due to amount of snow. Nice restaurant and market nearby. It is small but comfortable for two kids and parent. Nice gas fireplace, some games, cable channels and kitchen well equipped. Double bed very comfy but needed extra blankets for the hideabed. Despite the snowstorm...can't control nature...we had a wonderful time in this clean cozy cabin. The area is beautiful, and the neighbors we met while sledding down the street were quite friendly and welcoming. We were especially impressed that the property manager responded promptly during a significant snowfall and brought us a much-needed snow shovel to make sure we could get our car out in the morning. All in all a really pleasant stay. I'd highly recommend it. We had a great time here. The cottage is well laid out and very comfortable. Good location, quiet, close to Sugar Pine State Park, great x-country skiing. Especially loved the location in Tahoma and the house was more than adequate for two people. The bathroom is small but manageable. Perfect cabin for two people (and one fido). Clean and well appointed. Arrived there in the middle of a snow storm but the streets were plowed as well as the driveway. It well situated a block away from the Sugarpine State Park for cross country skiing and snow shoeing. The central heating could be a little bit quieter and it could use a DVD player .. but those are minor issues. The only thing we brought was food, lemon-pepper seasononig and our stove-top espresso maker. In general it couldn't have been more comfortable. Management resolved a couple of very minor issues with one phone call. We were looking for a comfortable place to experience the Lake and a little bit of winter snow and this home fit the bill perfectly. We felt right at home, warm and cozy, during the first two days while it snowed outside. Then, for the next days, we enjoyed exploring all of the local features around Lake Tahoe, knowing that we could look forward to our home-away-from-home when we were done at the end of the day. Loved it! Clean and comfortable. We will be back. We are just delighted! I have issues with stairs, so we needed a place without them. Loved this place. All of our needs were met and our expectations exceeded - nice quiet street, beautifully remodeled, super-clean,Well-stocked, convenient commercial uses. Perfect for the 2 of us! We can't wait to return (often). A great accommodation option and a short walk from the Lake with stunning views across the water. The lodge is well located and includes all the amenities you could require to make your stay cosy and comfortable. A short drive from Tahoe City where there is a choice of restaurants, shops, bars and spas. The Emerald Bay is about a 30-45mins drive too but providing great views across the lake from different vantage points. A great place to stay and would recommend to anyone looking for a peaceful break in a little hideaway. Cosy cabin exactly as described. Could not have been happier with our choice to stay here! This was our second rental of this place. Would use it again. Stayed here for the Lake Tahoe Marathon weekend. Perfect location tucked away amongst beautiful trees. The cabin was cozy and met our needs very well. 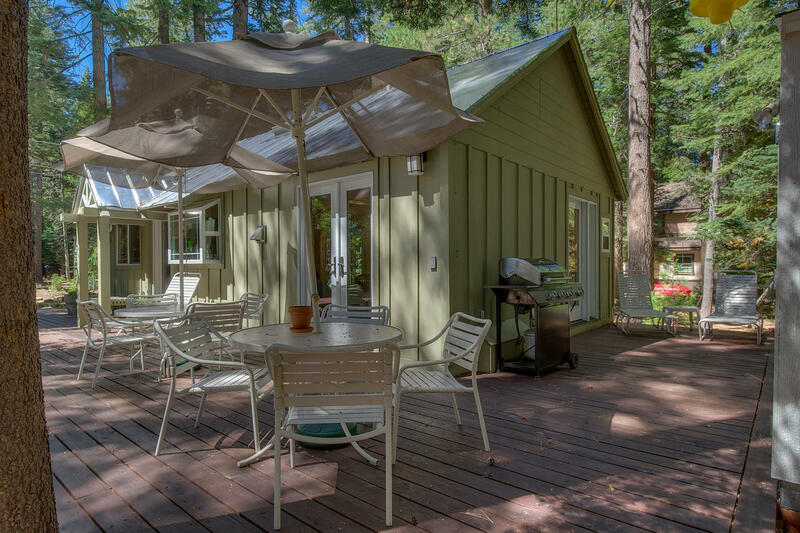 This cabin is nicely situated in Tahoma which offers a lot of quiet flat walking streets. It's even walking distance from the little store. It was tidy and well-equiped. We had an issue with the wifi one day but were able to troubleshoot it ourselves. We will definitely consider renting this place in the future. My wife and I spent four nights here and really enjoyed it. Very comfortable little place. It was clean when we arrived and everything was in good order. 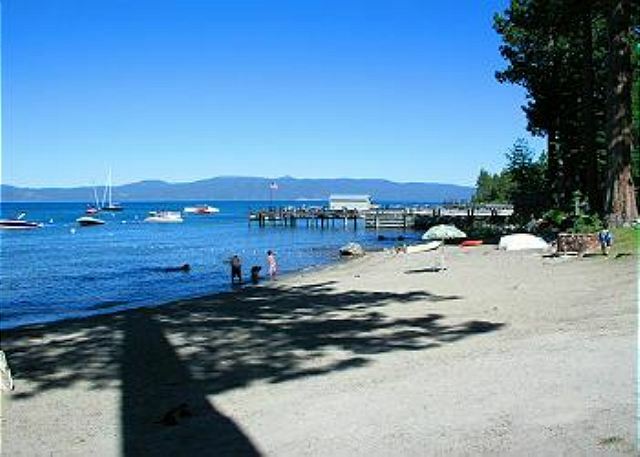 We especially liked its proximity to Sugar Pine Point State Park which offers some nice walks and lakeside activities. We would definitely rent this place again. This was a great location for our trip to Tahoe this summer. Easy to find, and clean upon arrival. Accommodations had everything we needed. It was a great location, just a short drive from Tahoe City, or South Lake Tahoe, with access to multiple beaches and sights. Would recommend to others, and I would stay again in the future. We very much enjoyed our stay. The cabin/condo was very quaint and cozy. The location was absolutely ideal. We were about 10 minutes from Tahoe city, about 20 minutes from Emerald Bay, and about 30 minutes from Squaw Valley.The area around the cabin/condo is also very quiet and peaceful. Perfect place to celebrate our 2nd wedding anniversary! Lake not quite as close as led to believe, but definitely accessible. Peaceful location, very helpful caretaker, more than adequately provisioned and LOTS OF HOT WATER!!! Reasonably priced, warm and cozy! Stayed 4 nights, had a very nice family vacation. We had a lot of fun during our visit the weekend of 12/3/16. The cabin was very nice, fireplace was very nice to have to warn up after winter activities. Very quiet and we will have no problem renting this cabin again. This place is great for small families, 4 max and small pet. They keep the place very clean,it's well equipped, but not great setup for serious cooking. stove does not have a hood to if you are cooking something that needs ventilation, you have to open the front door. TV in the bedroom did not work, but we weren't there to watch TV. Other than that, we had a great stay. My wife and I enjoyed our stay, the cabin was the perfect size for the two of us. quiet and cozy. A short walk to the beach and a nice drive to any amenities. We will stay here again. My husband and I stayed here for our anniversary weekend and absolutely loved it! It's cozy without being cramped, very comfortable and it's in a nice, quiet location away from crowded areas while still being within a short drive to whatever you may need. I am especially appreciative of Trent for taking the time to help my husband and I after we checked out and accidentally forgot an item in the cabin of great sentimental value to us. With his help we were able to retrieve the item the very next day. We would be happy to stay here again and would highly recommend it to anyone! follow up review by guest: We loved our stay. The cabin is updated with light, cozy, very comfortable bed and well stocked kitchen to cook. The deck was a great place to enjoy our morning coffee and our dog Max loved just laying on the deck enjoying the sun while he wondered what the little furballs were scurrying on the ground and up the trees (he had never seen chipmunks before). It was a very peaceful, relaxing stay and we have been talking about when we can go back. Well maintained and well stocked. Had a wonderful Memorial Weekend stay! We loved our visit to Tahoma. The house was adorable and so clean. The location was perfect for visiting Truckee and Tahoe City. We were able to drive everywhere we were interested in quickly, and loved being located in a wooded area. Rent it. You won't be disappointed! This property was exactly as advertised, and the management company was a pleasure to work with. The most relaxing vacation I've had in a long time. Adorable house and very comfortable. I would definitely rent again when I visit Lake Tahoe. The management handled my last-minute request kindly. The cabin is beautiful and the deck is connected to another one. It was quiet and trees were green. I brought my own shampoo, coffee and some area rugs to protect my old dog's hips. If you forget something, there is a market on W Lake Blvd.